Do you notice a circular rash with a red center anywhere on your baby’s body? Is your dear little one suffering from mild fever and weakness? If you nodded along worriedly, your baby might be suffering from Lyme disease. Read on to learn about the causes, symptoms, and treatments for Lyme disease. Lyme disease is a tick-borne bacterial disease, particularly occurring in areas in which mice and deer thrive. The infection first occurred in Connecticut in 1975 near Lyme town, and it’s still common in the Atlantic states. The ailment can be difficult to diagnose since its early symptoms are vague. However, the infection progresses over many years, so you need to treat it as soon as your doctor diagnoses it (1). Lyme disease occurs in babies due to an attack by the Borrelia burgdorferi bacteria. Black-legged ticks are the carriers of these bacteria and pick them when they bite an infected mouse or deer. 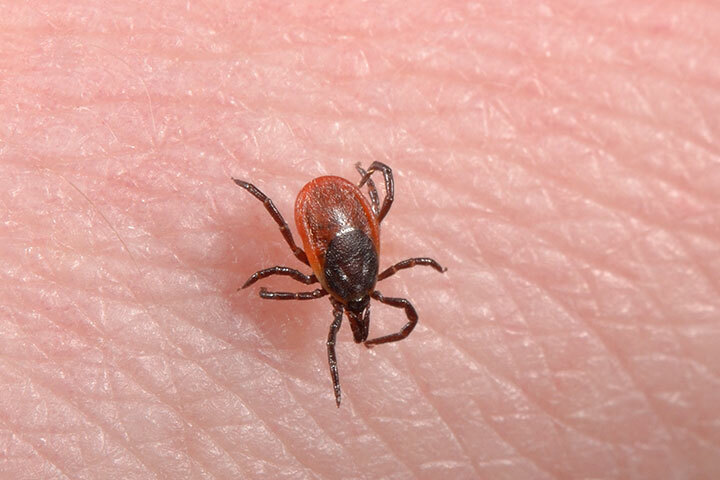 Ticks can transmit the bacterial infection to babies if they manage to remain attached until 36 hours post a bite (2). Bull’s eye rash i.e. a circular rash with a red center and border and white middle, particularly on the baby’s scalp. Diagnosis of the Lyme disease in babies is quite tricky since its initial symptoms are vague. However, blood tests can help you confirm the bacterial infection. Consult your pediatrician if you observe any of the above symptoms in your babies. Antibiotics are highly effective in curing the ailment in babies. Pediatricians prescribe amoxicillin or penicillin to treat babies suffering from Lyme disease. Usually, pediatricians suggest consumption of antibiotics orally but intravenous treatment is effective in severe cases (4). Ensure that your baby takes adequate rest to recover fast. The rest will help minimize the weakness resulting due to Lyme disease and make her feel better. Cover your baby’s arms and legs with long-sleeved clothes and pants to prevent the attack of ticks. Make your baby wear a cap to protect her scalp from ticks. Make your baby wear light-colored clothing so that you can easily spot the ticks. Prevent your baby from going in the damp, shaded areas, which may be the breeding grounds for ticks. Place your baby’s clothing in a hot dryer for an hour after washing to eradicate ticks. Give your baby a shower within two hours of outdoor activity. Do a tick check especially under the arms, in and around the ears, inside the belly button, back of the knees, in and around the hair, between the legs and around the waist. Use repellents, such as DEET that are effective against ticks. Using products containing more than 20% DEET can provide prolonged protection. Excess of DEET can prove harmful to your baby (5). Do check with your baby’s doctor to learn about more tips to prevent Lyme disease. Did your baby suffer from Lyme disease at any time? How did the doctor treat it? Share your knowledge and experience with fellow moms.